Once I start my regular volunteer shifts at the wildlife rehabilitation center, my Saturdays get rather birdy which is exactly how I like it. While I’ve had a lot of fun this year caring for many feathered friends, I have to say that my crush for the season must go to the American Goldfinch. 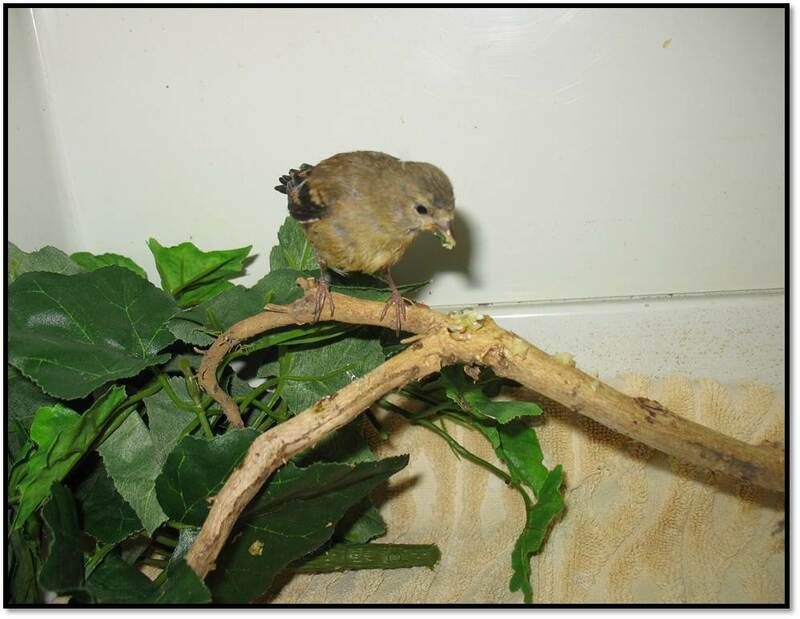 The center received a few nestling goldfinch in August and September, well after the usual rush of little ones that check in for care and a second chance. I recently learned that their breeding season is later than most other North American birds because it is the time of the season when fibrous seeds, used for feeding young, are produced from plants like thistle and milkweed. I’ve always thought that goldfinch are as pretty and fun to watch as most other birds at our feeders, but now that I’ve been able to care for some little ones, I’ve fallen hopelessly beak over talons for these squeaky little golden nuggets. 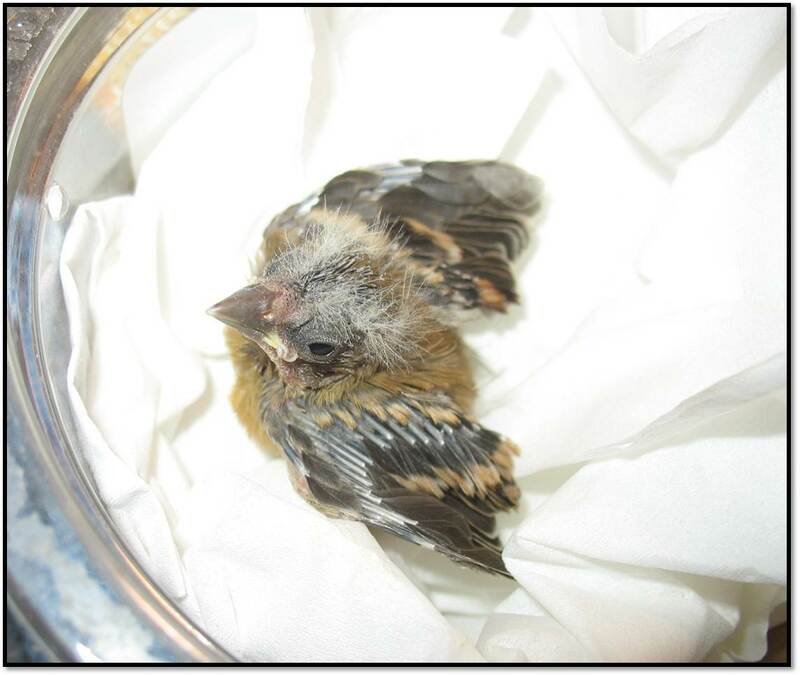 Orphaned young female American Goldfinch nestling. As this one female goldfinch started to learn to feed herself and was getting weaned off of hand-feeding, I discovered that she liked the food placed upon branches. She would gape like she wanted to be fed, but would then back away, like her instincts were kicking in at the same time, telling her that she should be feeding herself. Following her lead, I would place little bits of food on the branch. I’m not a bird expert, but judging by her reaction, food that would magically appear on a branch just millimeters from her beak seemed to go over exceptionally well. Eating on her own and perching pretty! I’m simply delighted that this sweet little bird, the only survivor from a fallen nest, was recently released. 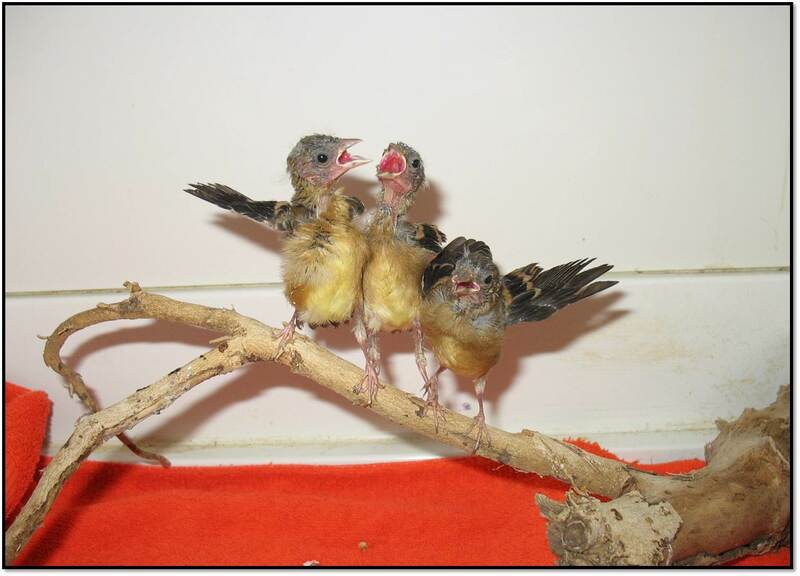 There is a sibling trio of orphaned goldfinch that will be ready for release soon as well. Like any other group of siblings, this bird bunch has squabbled, jumped on each other, fought over food, knocked each other over, chatted about who-knows-what, learned from one another, and become bothered when temporarily separated. As the trees start to display their autumn colors, as falling temperatures coax us in to fuzzy sweatshirts, and as marketers wheedle us in to purchasing pumpkin-inspired everything, I find that my eye has perhaps wandered a bit here and there towards a devilishly handsome crow that is recovering from a wing injury. Is this popular symbol of the season already vying for position as my new corvid crush? PLEASE consult a licensed wildlife rehabilitator any time you find orphaned wildlife. Providing the wrong food or feeding improperly can lead to the death of that bird or animal. Aww, how sweet! Especially love the last photo — they look like the Andrews Sisters!